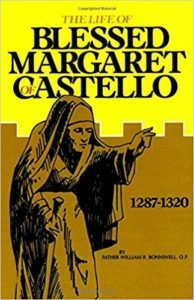 Dominican Father William Bonniwell (+1984), an esteemed friar and scholar of the Dominican Province of St. Joseph, wrote the most comprehensive biography of Blessed Margaret of Castello. To this day, he is still remembered fondly in the City of Castello for his work in renewing her cause for canonization. This timeless classic on the Patroness of the Unwanted is available from the Guild or directly from TAN Publishing. 128 pages. Click here to buy from Tan Books. Please also be sure to check out the items in our store. The inspiring movie of Blessed Margaret produced by our own Blessed Margaret Guild and Shrine.